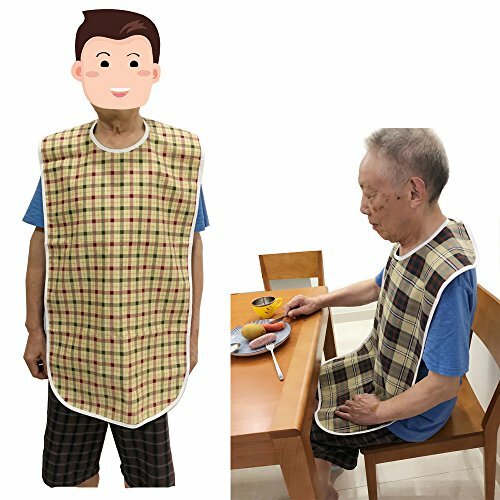 Adult bibs 2 pcs/sets - Easy to replace. Fits User: Adult women or men, Seniors, Handicapped, Elderly, Disabled, Bariatric patients. The front material is superfine fiber with favorable color design and easy to clean. The back material is of soft PU waterproof cloth, yet light and breathable. There are two different ways to close: Velcro closure and metal snap closure. Comfortably accommodates a range of neck sizes. However, I suggest that the neck size be controlled within 19.5 inches. Soft material, extra long design provides full protection for your chest and lap. Feels like an "apron"
When it is dirty you can clean it with wet cloth or flush it by water. You'll be able to wash and reuse this bib over and over again, no more wasting money on ill-fitting disposable bibs. Can keep clothes clean by preventing food from polluting clothing and it is not easy to stick to oil and easy to clean. This subtle design for men and women doesn't look like your "typical bib" and helps to hide stains, increasing confidence during mealtimes. The refreshing fabric pattern gives the patient spiritual pleasure but also facilitates daily nursing work of the nursing staff. All in all, it helps keep the wearer neat and meal area cleaner to reduce clean up time. Now to enjoy the convenience of these attractive, durable and easy to use clothing protectors. HIGH QUALITY FABRIC - The front material is superfine fiber with favorable color design and easy to clean. The back material is of soft PU waterproof cloth, yet light and breathable. COMFORTABLY NECK CLOSURE -There are two different ways to close: Velcro closure and metal snap closure. Comfortably accommodates a range of neck sizes. However, I suggest that the neck size be controlled within 19.5 inches. HUMANIZED DESIGN PROTECTS CHEST AND LAP - Soft material, extra long design provides full protection for your chest and lap. Feels like an "apron"
REUSABLE, MACHINE WASH & DRY - You'll be able to wash and reuse this bib over and over again, no more wasting money on ill-fitting disposable bibs.